This debate took place on Feb 25, in the leadup to Super Tuesday on March 1, 2016. In the Super Tuesday contests, pundits pronounced that Trump won Massachusetts by a wider margin than did Hillary. That's technically true, but misleading: The two primaries are two entirely separate elections, so Trump and Hillary did not compete against each other. Clinton won the Democratic primary with 571,888 out of 1,138,586 votes; Trump won the Republican primary with 298,827 out of 609,832 votes. In other words, Hillary got nearly twice as many votes as Trump in Massachusetts, because so many more people voted in the Democratic primary. 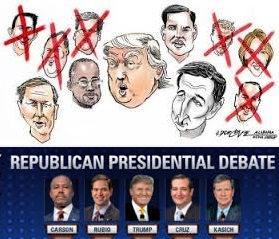 The above quotations are from CNN-Telemundo Republican debate on the eve of the Texas primary.